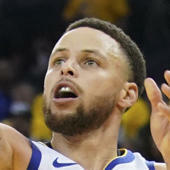 Curry amassed 24 points (8-20 FG 3-9 3Pt, 5-5 FT), five assists, four rebounds and two steals in 35 minutes during Wednesday's 106-104 win over the Rockets. Curry has swiped at least two steals in three of five games here in March, but he has reached his scoring average just once. It likely won't be long before Curry unleashes another big scoring night, with Saturday's matchup against the Thunder looming large.